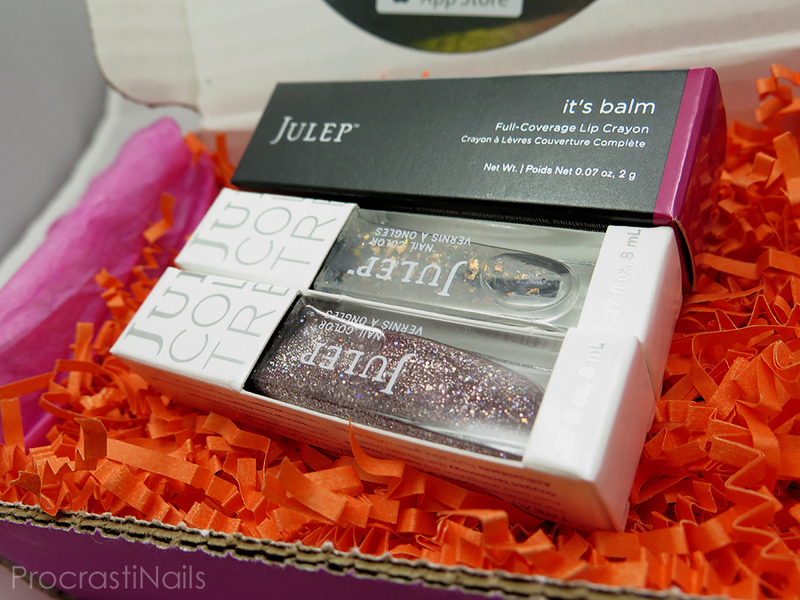 My Julep Maven (June 2015) MyMaven Box Unboxing, Swatch and Review! I'm a bit late with this box, and I want to apologize for that! It's been sitting on my desk for over a month practically unopened, if you can believe it. I went through a recent burst of swatching and art-ing and blogging and this box was one of the ones that got caught up in my whirlwind of productivity (along with my July box!) so here we are! Let's jump right into it after the cut! I'm going to be honest - at this point I can't even remember what the theme for this month was supposed to be. I'm thinking something beachy? Hm. Not impressed that the quote cards are no longer little squares - I loved being able to put them up in my cubicle at work when they had quotes I liked! 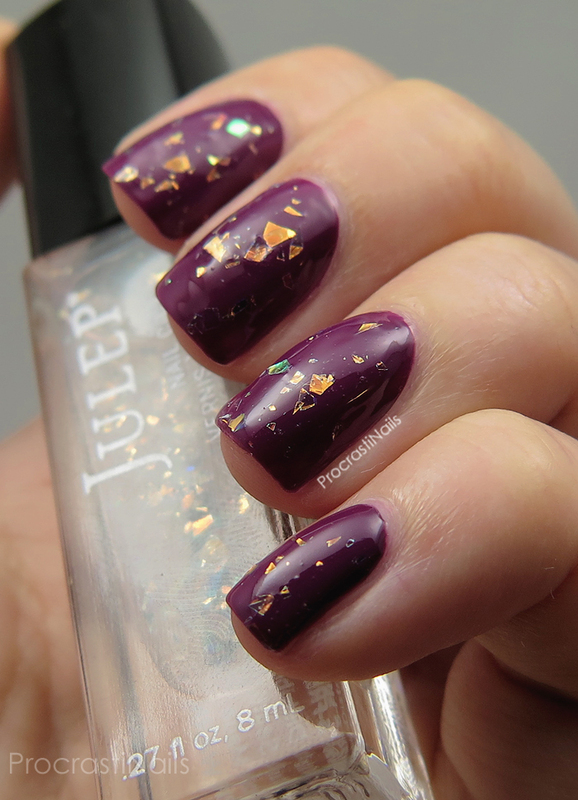 :( Dislike, Julep. Unfortunately, this shade was a bit more bright pink than I was expecting. I didn't love it on my lips, though after wearing it out for a day I grew used to it. Definitely not one of my favourites, though. That honour will remain saved for my love Magenta Plum. I decided to swatch Harmony over this gorgeous deep plum to see what colours I could get to come through in those lovely iridescent (not holo, Julep) flakes. It leans heavily orange with flashes of green and blue, though I would have to swatch it over a black and white to get a real idea of the spectrum of colour. 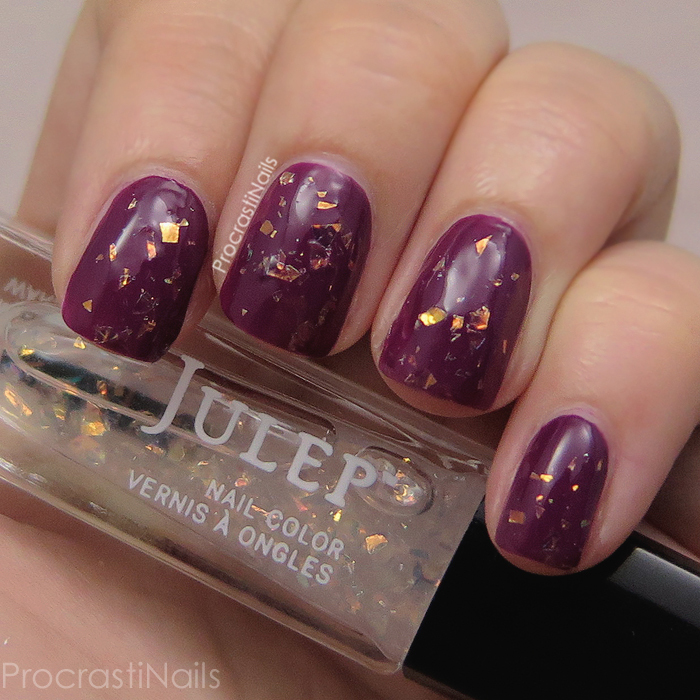 I do have to take a minute to comment on the application of this polish - it was a bit of a nightmare. The base was quite goopy and it was difficult to get the flakes onto the brush. What you see here is two coats of polish (with digging for the flakes) as well as a round of sponging on some extra bits. The base really wanted to goop up on the nail so I had to be careful of that, and it needed a top coat to smooth it all down in the end. Too labour intensive, and not a gorgeous or unique enough polish to be worth it! I wasn't super excited about Yumi but I'm relieved to say I really like it on the nail. 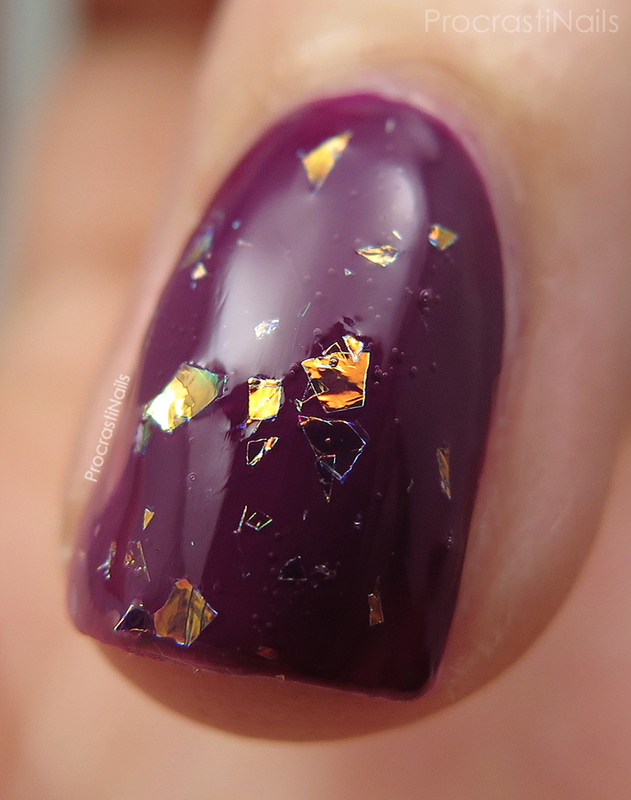 I've already used this as the base for some upcoming nail art, and I really love the spectrum of colour that comes through in the scattered holo when you shift it in the light. What you see here is three coats of polish and I had zero issues with application. It didn't goop up or make bald patches on subsequent strokes or anything! I did have to put a layer of top coat on it since the shine was a bit dulled when it dried. Even though you can still see some visible nail line I don't really mind as that's pretty normal for a pure glitter polish. Overall I'd give this month's box a 6 out of 10. 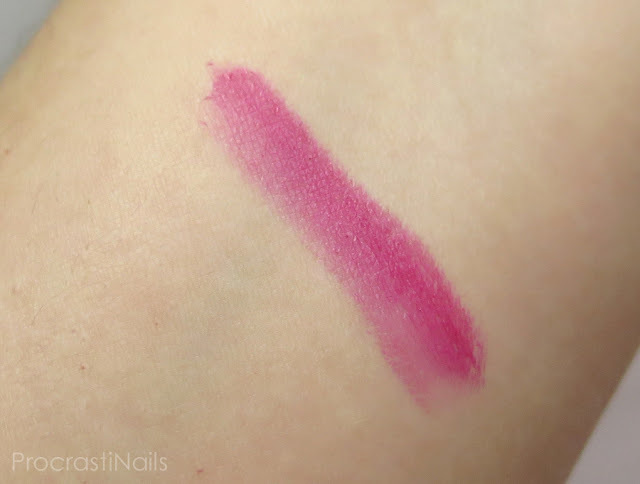 I only really liked one of the polishes I picked up, and the lip crayon wasn't as deep a shade as I had been hoping it would be based on swatches online. That being said nothing was terrible (well okay, the application of Harmony was a bit terrible). Hm. About the Julep Maven Program: The Julep Maven program costs $24.99 a month and is fully customizable, or you can pre-pay for 3 months and receive each box for $19.99. You can also upgrade to the Maven Luxe program for $39.99 a month ($34.99/mo if you pre-pay for 3 months) which entitles you to a fully customizable box plus one additional product per month. And you can skip or send to a friend whenever you want! Oh Yumi, why so pretty?? It had to be a PITA to remove thought, wasn't it? Yumi is so sparkly and girly, I really like it :). I'm really loving Yumi and that lippie too! IT's a bummer about Harmony because that's the one I like the best. Yumi sure looks pretty! But I'm disappointed about Harmony, too much fuzz!